Genus Hylotelephium is closely related to Sedum in which it is often included. In this work it is accepted as a distinct genus Hylotelephium following Russian taxonomists. H. populifolium (Pall.) 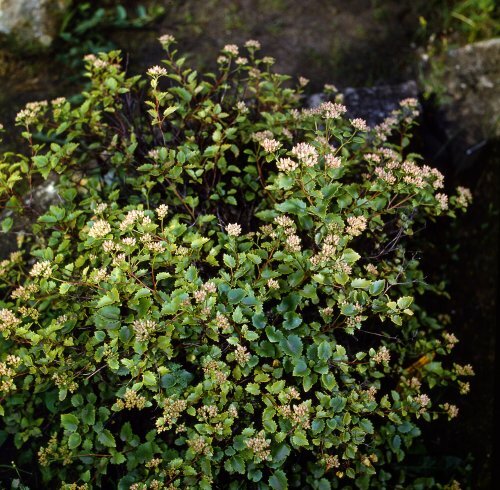 H. Ohba (Sedum populifolium Pall.). Siberia (eastern Altay and western Sayan mountains). In shady humid places, on rocks and on riverbanks. Dwarf shrublet of about 40-50 cm. Leaves long-petiolate, oblong, coarsely toothed, 2-4 cm x 1-2 cm. Flowers minute, white or pink in copious, much-branched corymbose cymes. Fruits red when ripe. V - mid spring to late autumn. F - early summer, June-July in St. Petersburg, for 3-4 weeks. Fr - August. P - by seed and cuttings. Come into flower the year after sowing. Does very well in sunny places on limestone soil, in crevices of dry walls. Very well suited to the rock garden. Z 4 (3).